Side of house. Additional eating area and swing. Back deck with grill, large table, outdoor shower (not pictured). 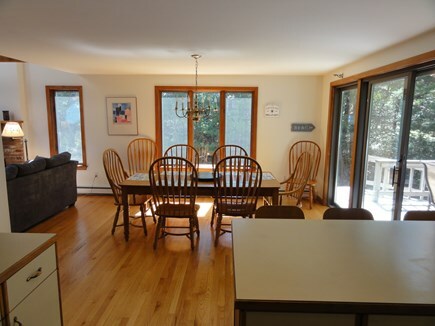 Lovely, clean, light-filled, year round Cape house on a quiet, wooded street, one block from Cape Cod Rail Trail, a paved bike and walking path. Bike in ten minutes to Marconi Beach or French Bakery. 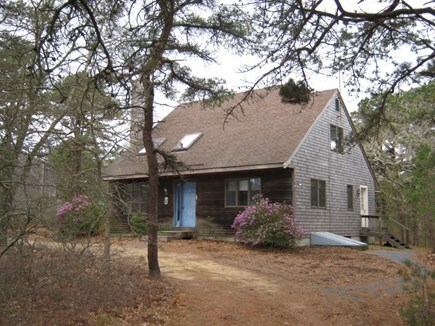 Easy access to beaches, ponds, and the town of Wellfleet. Surrounded by National Seashore land. Owners have renovated the home with refinished hardwood floors, freshly painted walls, new furniture and bedding and new small appliances. The spacious home features a cathedral ceiling living room with skylight, fully-equipped kitchen, a first floor bedroom and a large bedroom and a master bedroom with skylight upstairs. 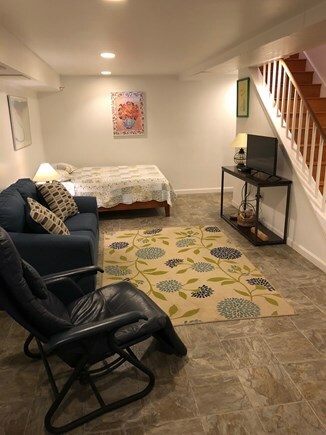 The basement includes a family/game room and a ping pong table.. Other amenities include wireless internet, 50-inch HDTV with Blu-Ray/DVD player, iPod home, sunny private back deck with new gas grill, an outdoor shower,and a laundry room off of kitchen. Home is stocked with beach chairs and toys, games and baby supplies including a high chair and pack and play. A Keurig coffee maker is a recent addition. Three bicycles are available for your use. 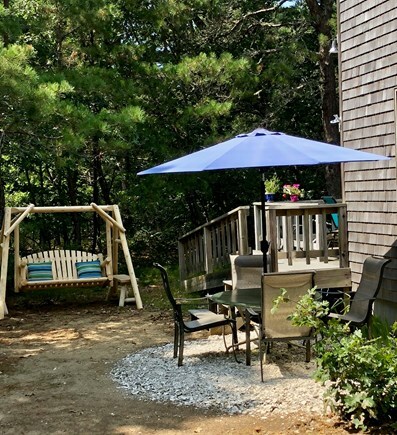 The property borders the Cape Cod National Seashore with many trails to explore including a less than one and a half mile walk/bike to Marconi Beach.It is a three minute drive to the beach. 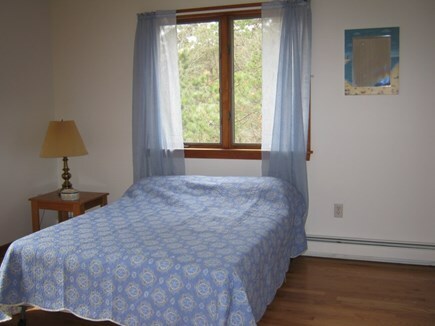 The house is convenient to numerous bay and ocean beaches and fresh water ponds. Walk to the Audubon wildlife sanctuary, flea market,fresh fruit and vegetable stand,and deli.Nearby is the drive-in movie theater, numerous art galleries and restaurants, tennis courts, and several golf courses. 20 minute drive to Provincetown. Also available off season for long weekends and weekly. Additional availability info: Available full or partial week June 23-30 or July 7-16. This is a Saturday to Saturday vacation rental. Additional pricing info: Available off season weekends $450 to $650 Discount for multiple weeks. State and local taxes of 12.45% will apply. My friends and I had the most wonderful weekend at this beautiful home in Wellfleet. It was the perfect setting, inside and out, for a relaxing Cape Cod mini-vacation. The close proximity to the bike path was what made this home really stand out. It was so convenient for us to ride to Marconi or PB Boulangerie for a treat. We are already looking forward to staying here again next year. You will not be disappointed renting this lovely home! 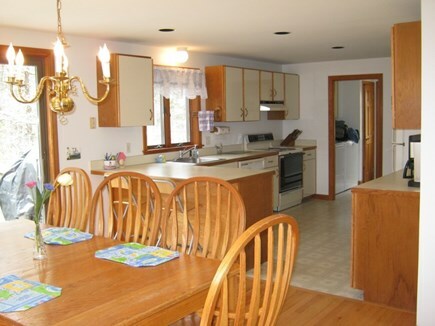 We have rented houses all over the country and have yet to find a house that was as family-friendly as Jeanne's. The fooseball, ping pong, air hockey and board games in the cozy basement was the perfect remedy to rainy day blues. It was also nice to give a bit of breathing room for mom and dad. The house is right on the bike trail and a mile and a half from the big waves at Marconi Beach. If you need space and on site activities, this is an excellent choice. Our family of four stayed for a long weekend at this wonderful location. The house was well maintained and tidy, and worked perfectly for our trip. The owners were very helpful and accommodating. It was easy for us to explore this beautiful part of the Cape including the beaches, ponds, nature preserve, and restaurants, and was a short trip to Provincetown. We would love to return and stay here again on our next trip! The house was bright, spacious and very comfortable. The kitchen was very well equipped also . It was great to have the downstairs with games and a ping pong table. It was special to be so close to the bike path and to be able to use the owners bikes. 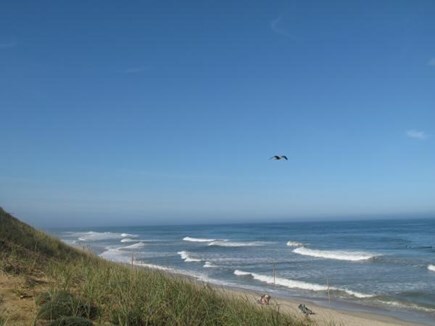 Some family members biked to Marconi beach and others went in the other direction to other National Seashore beaches. We also easily drove to ponds and bay beaches in Wellfleet. The house was perfect and we loved the ping pong table in the basement. Everything was there that we needed. It was close to all and there was plenty of info which we liked as to hike reviews etc. Jean was a great owner to work with. We loved this cottage. There's great open space inside, a real benefit with a one year old. The bedrooms were spacious and the bikes and ping pong table were a big hit. 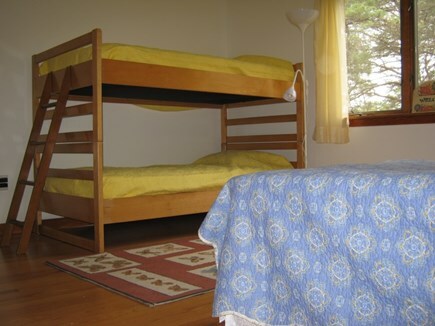 It' s located in a very quiet neighborhood with easy access to the bike path and a short ride to the beaches. We spent a lovely week at the house and could not have asked for a better temporary home. The house is spacious and accommodated two families easily. It is very well stocked with kitchen items and beach supplies. We enjoyed dinners on the deck outside and the kids loved the basement, with its ping pong table and games. Jeanne is very organized and made the rental process smooth and easy. 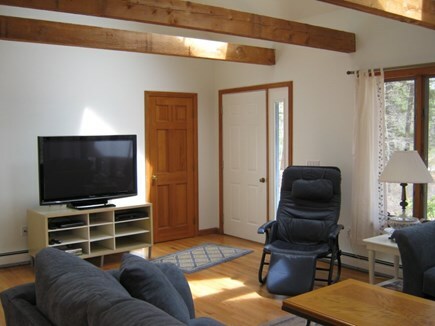 Cape Cod is the perfect vacation spot and the house is conveniently located. Would go back in a heartbeat! About the owner: We fell in love with this bright and airy house nestled in the woods, close to the bike path and the beach. It is an easy and comfortable home to live in. Before purchasing the house, we had vacationed in Wellfleeet every summer for 25 years. Wellfleet is a wonderful town with much to offer for kids, adults and families and there is always something new to discover. 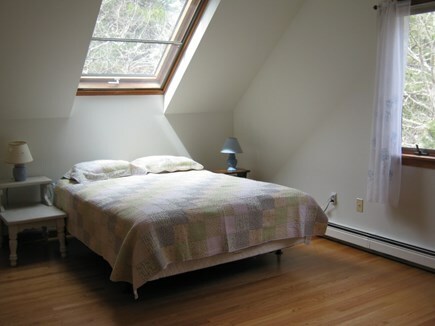 Our home provides a quiet, relaxing sanctuary and easy access to all that Wellfleet and the outer cape has to offer. 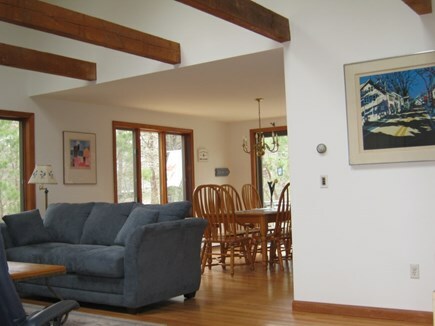 The house is light filled and airy even as it is surrounded by pine trees, giving a feeling of being in the woods. The back deck allows us to have meals outside and to relax after a day exploring the Cape. We like to put a plant with bright flowers and a hummingbird feeder on the back deck and watch the hummingbirds come in the early evening. With the finished basement, kids can have their own space to play games and ping pong. 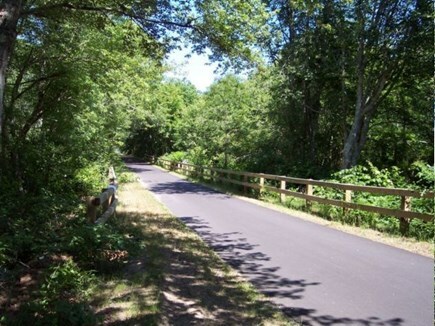 We love being close to the Cape Cod Rail Trail and the variety of hiking trails at the National Seashore. 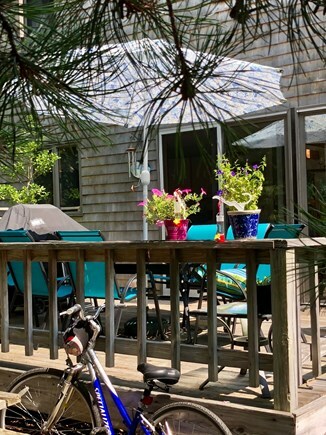 We can be at the beach, a fresh-water pond or the beautiful art galleries and shops of downtown Wellfleet in a matter of minutes. The Massachusetts Audubon Society is right across the street and the drive-in movie theater/flea market are just down the road. Provincetown, with it's shops and nightlife, is a short car ride. 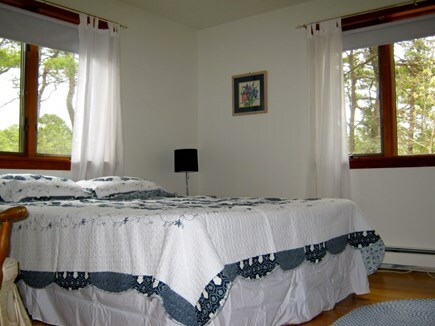 Our home is a wonderful place to relax after a day full of all the activities Wellfleet and the Cape has to offer.